Inaugurated in 1999, the Teatro Moderno is situated where formerly the old cinema existed. This stage had been reclaimed for a long time and fills now the former cultural gap in our city. 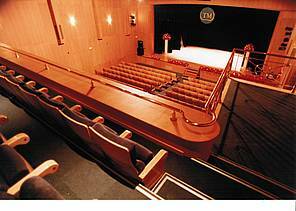 During these years, the Teatro Moderno consolidated thanks to a rich and varied programmation. It is now not only a local reference but also in the whole province which can be noted by the constant presence of a public from nearby villages. 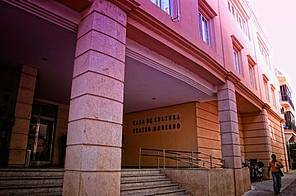 Many known artists passed the Teatro Moderno during the last three years enhancing its reputation and prestige in Chiclana and around. Being a public theatre we have various commitments: to the public and their demand but also to the professional companies and amateurs reclaiming the stage for their performances. The fact of sharing the building with the House of Culture enriched the theatre programm leading to interesting thematic cycles including theatre, musik, art, etc...with conferences, readings or cinema. Especially non commercial films improve the theatre programm and offer an alternative for many spectators. A theatre that is not only for you but yours, offer fourhundert seats waiting for an acknowledgement from the public for the constant effort of those who work for the realization of the cultural programm of our city.